SUZHOU, China, May 3, 2017 /PRNewswire/ -- Stainwei Biotech, Inc. (Stainwei), a Chinese biotech company located in Biobay industrial park in Suzhou, China, announced today that it has received a patent certificate (Patent No. US9,580,498) issued by the United States Patent and Trademark Office (USPTO) for its novel humanized anti-VEGF monoclonal antibody (mAb code name: hPV19). This patent was issued through a pathway of PCT application (PCT/CN2013/086542) filed by Stainwei in 2013. Prior to receiving the US patent, Stainwei has already received two patent certificates for this antibody from China Intellectual Property Office in 2015 and 2016. Stainwei is dedicated to innovation and development of novel therapeutic antibody drugs targeting cancers, age-related macular degeneration (AMD) and immune-related diseases. A phase I clinical trial evaluating the safety and efficacy of hPV19 in cancer patients is ongoing in China. According to the data released by the company, hPV19 has a unique antigen recognition site (epitope), composed of amino acid sequences different from other commercially available antibodies targeting the same antigen. In both in-vitro and in-vivo experiments, hPV19 showed a 6-8 times higher biological activity than Avastin (generic name: bevacizumab, Roche/Genentech's anti-VEGF mAb, the world's first and so far still the only FDA-approved anti-VEGF mAb drug on the market). "In pre-clinical animal studies and early stage clinical trials in cancer patients, hPV19 has also demonstrated an excellent safety and tolerance profile," said Dr. Qunmin Zhou, the company's co-founder. "We are excited to test its efficacy in the ongoing clinical trials. We are also excited to hopefully bring to the market a unique, non-biosimilar, and stronger therapeutic agent that can benefit our patients." Meanwhile, Stainwei has filed a PCT patent application for a new formulation of hPV19 mAb intended for the treatment of age-related macular degeneration (AMD), diabetic macular edema (DME) and other eye-disorders associated with VEGF-mediated vascular over-growth. Stainwei has completed preclinical experiments and an application for Investigational New Drug (IND) in AMD and DME will be submitted to China-FDA soon. The company's another promising product is a novel anti-PD-1 monoclonal antibody named hAb21 (humanized IgG4-kappa version). hAb21 binds to human PD-1 antigen at a unique site (epitope), which is different from that of Keytruda (Merck) and Opdivo (Bristol-Myers Squibb). hAb21 has shown a remarkable anti-tumor activity in human PD-1 gene knock-in mouse models. Figure: Effect of hAb21 mAb on tumor growth in knock-in mice expressing human PD-1 （Human PD-1 gene knock-in mice were inoculated with 1x106 syngeneic MC38 tumor cells. When tumors reached 50 mm3 in size，mice were randomized into 3 groups. Intra-peritoneal (i.p) injections with 200 ug mAb (pembrolizumab or hAb21) or saline were given on days 6, 10, 13 and 17 after inoculation. A: Tumor growth in early-stage; B: Tumor growth in both early- and later-stage）. 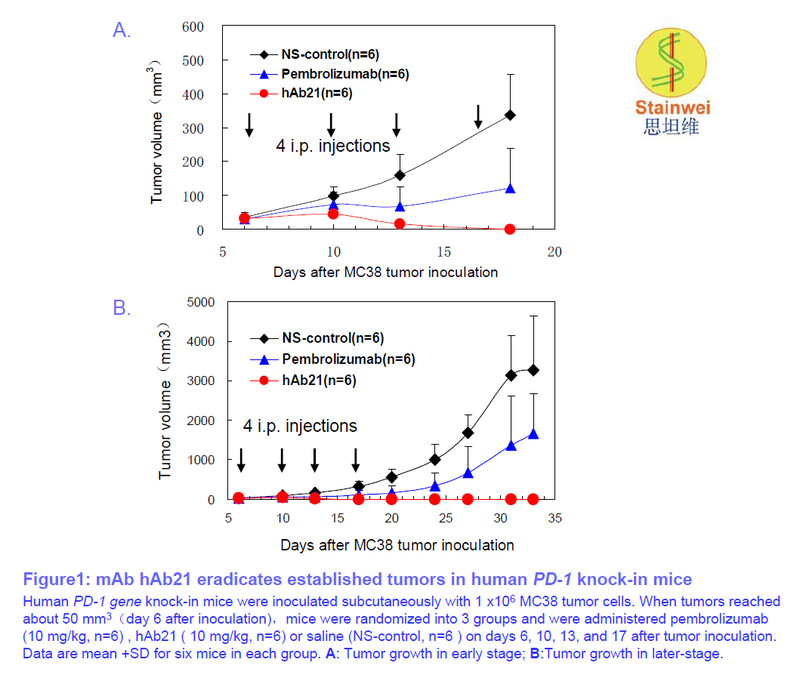 As illustrated in the above figure, syngenic MC38 tumors implanted in the PD-1 gene knock-in mice were completely rejected within 7-10 days without re-growth thereafter in all 6 mice in the group treated with hAb21. Furthermore, repeated MC38 tumor inoculation was performed to those mice on day 30, and tumors were again completely rejected within 10-14 days without further hAb21 treatment. All 6 mice survived to day 60 and received MC38 inoculation for the third time (experiment on-going). In the same knock-in mice treated with Keytruda (pembrolizumab), complete tumor rejection was observed in only 1 out of 6 mice, while initial tumor regression followed by re-growth after the completion of Keytruda treatment were found in the other 5 mice, which all died of tumor progression. Based on these encouraging results, Stainwei has filed a patent application for hAb21, and is currently carrying out IND-enabling studies. An IND indication for advanced solid tumors is expected to be submitted to China-FDA and US-FDA in the second-half of 2017. Stainwei (www.stainwei.cn) was founded in May 2007 at Suzhou-Biobay, China. It currently has more than 10 monoclonal antibodies in the pipeline, targeting either well-known antigens such as VEGF, PD-1/PD-L1, PD-1H (VISTA), CTLA-4, SOST or other potential targets not to be disclosed at this time. Since its inception, Stainwei has received VC-funding of more than 100 million RMB from a number of institutions, which include Cowin Venture (Suzhou), Xiangtang Venture (Suzhou), Fortune-link (Shanghai) and Comway Capital (An-hui). Its therapeutic antibody program has also been supported by research grants from the Chinese government,Jiangsu province, Suzhou municipal city and Singapore-China Suzhou Industrial Park (SIP-Suzhou).